Kal Tire was started in 1953 by Thomas J Foord and Jim Lochhead with the goal of servicing the commercial logging operations, that operated in the Okanagan Valley around Vernon and Nakusp in British Columbia, by building customers’ trust. Its business comprises retail tyre sales for passenger and light truck vehicles, mechanical services for passenger and light trucks, commercial truck tyres, mining and off-road sales and the service and retreading of both commercial and off-road tyres. Kal Tire was named after Kalamalka Lake, the prominent “Lake of many colours” landmark in Vernon. The business covers a market that includes British Columbia, Alberta, Yukon, Northwest Territories, Saskatchewan, Manitoba, Northern Ontario, parts of Southern Ontario and Quebec, as well as mining operations in Mexico, Panama, Colombia, Chile, the United Kingdom, Ghana, Mozambique, Sierra Leone, South Africa, Tanzania, Zambia, Burkina Faso, and Australia. To find out more, Greg Simpson caught up with Vice President of southern African operations at Kal Tire, John Martin. Can you tell me a bit about your background and your role at the company? I am a mining engineer by profession. At the end of 1990, I graduated in South Africa and have been on both sides of the desk, so to say. I worked for a couple of big mining companies and also some international manufacturing and supply companies. I travelled the world a little bit, lived and worked in places like Chile and Dubai, Switzerland, and joined Kal Tire again in April last year. I came back to South Africa, extremely pleased to be back home and hoping to add some value to not just the business community but also the social communities. My role is Vice President of the Southern African operations, and we cover Botswana, Tanzania, the DRC, Zambia, Mozambique, Zimbabwe and of course the big market in South Africa. What separates you from the competition in a tight tyre market? Well, what separates us from competition is that number one, we are an independent company when it comes to tyre supply, and we don’t have our own tyre product. As a company we can select the best application, and the best tyre for the best application. We’re a service provider; we have tremendous capacity and capability in terms of understanding the technology and providing advice to the customer on how best to apply the various products that are specific to the mining operation or construction operation. Obviously, time is of the essence in any mining industry, a lot of the technology we bring contributes to productivity, improvements and saves on downtime when machines are standing in the yard for service and tyre repairs. We are one of very few companies that not only do the daily service and daily maintenance on tyres but provide extensive solutions on tyre repairs and tyre retreading. We work on ultra-large class tyres, and that’s not common among service providers like our company. Recycling is obviously a big component these days? Recycling is a major challenge, particularly for the southern African mining community. We are all aware of the Redisa initiative some years ago and now that’s terminated. Kal Tire brings a lot of capability and competence from offshore back into South Africa to help with the recycling of tyres, and we are actually lobbying both the Chamber of Mines, the Department of Environmental Affairs and others to ensure that we can contribute to that process. We have specialists within the company that are very clearly dedicated to the recycling process of tyres, and we have a lot of experience already. We would like to bring, for example, the recycling processes that we use in our North American operations to South Africa – obviously in association with stakeholders like the Department of Environmental Affairs. There’s always some great innovations coming out of North America in terms of tyres, they seem to be a couple years ahead of us? Very much so, it’s obviously a testing ground. 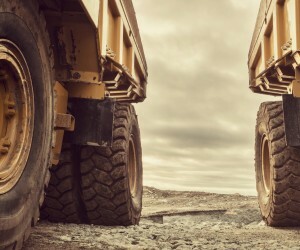 If you talk about surface mining operations, the big manufacturers put a lot of time and effort into operations like the Oil Sands, which contribute massive volumes of tyres. We work very closely with the big manufacturers like Michelin, Bridgestone and Goodyear, and intend to bring any technological advances that come out of that process to South Africa. Are you seeing more cheap tyres from China entering the market? You will always have the tier one suppliers and products heading the way of our Western Society, the tier two and tier three products are getting better, significantly better, and there’s a massive market for the tier two and tier three products. Chinese brands are becoming good enough for a lot of applications but of course there are a lot of applications where productivity and cost efficiencies justify some of the major mining companies prefering to take the tier one manufacturers over the tier three’s. You must have to provide your customers with a lot of consultation; these are big purchases we’re talking about here if you are changing all the tyres on a large truck? Absolutely, and a company like Kal Tire is part of the value chain in terms of how we assist customers to stretch their dollar as much as they possibly can. There has been a lot of innovation in terms of tyres: servicing and the services we provide, competence, innovations and safety, which is a massive issue around tyres, and particularly when you’re talking about these ultra-class tyres. Safety is a massive challenge for the mining companies when you go north of the South African border. Skills are probably not available at every turn and that’s when the Kal Tire’s of the world come into their own and provide value to the customer. Servicing in remote areas, that’s what separates the men from the boys in this business? Absolutely and again one can’t do it on your own when going into remote locations in Africa. It has to be a partnership, there has to be some understanding of the risks any company takes from both a safety perspective and of course a training perspective. It takes time to train people to do what they are supposed to do. I would imagine that you have sensors that can measure tyre pressure and longevity? Tyre technology, let’s say the digitalisation of it, is certainly well advanced. There are a number of solutions to managing things like pressure, temperature, performance of tyres through technology, GPS tracking, etc. These are available and actually well used in a number of locations throughout Africa. 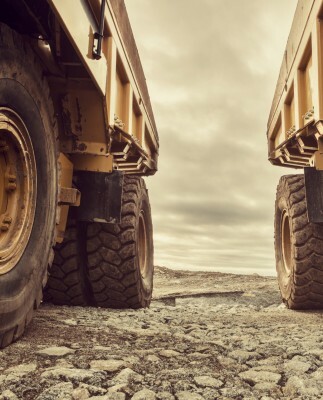 When a mine puts a million US dollars of tyres onto their trucks they want to know that the investment is very well managed and tracked at any point in time in the day. Do you ever see a time when there will be more tyre manufacturing in South Africa? I would love to see that, of course we would all love to see that. The mining industry probably needs to put some time and effort into whether that investment will be justified in South Africa. Currency fluctuations must play havoc with your business, how do you navigate this? Yes, it’s everybody’s challenge, currency fluctuations. The strengthening of the Rand in recent times has been positive and resulted in some cost reductions for our customer base and for us as a company. We pass that on to customers as much as we possibly can, but again it’s a tripartite agreement between ourselves, the suppliers and the customers as to how we manage those currencies. Because you’re working in a number of different currencies throughout the continent one justifies it according to commodity prices and components that make up the pricing, so it’s all well managed. After 100 years in the game Michelin and Goodyear are still premier brands, how do they manage to keep that going? Yes, there have been a lot of companies that have been in the game for a long time, Goodyear, Bridgestone of course Michelin as you mentioned. In terms of technology they’ve remained the premier manufacturers and suppliers globally, we don’t see that they’re going to be deposed in the near future. As I said earlier, some of the Chinese brands have improved but let’s see what happens.